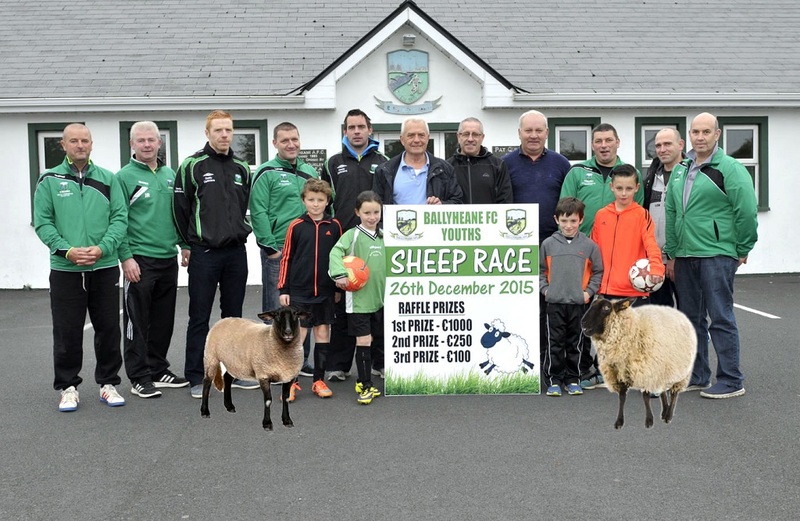 Pictured at Ballyheane Football Club at the launch of the fundraising sheep race which will take place at 3pm on 26th December in Ballyheane village all funds raised are going to the ongoing development of the football pitch. Committee members, front l-r ; Reece Jones, Emma Duffy, Adam Burton, Darragh Duffy. Back l-r; Nigel Jones Joe Redmond, Peter Burke, Paul Whiriskey, Padraic Mulroe, Flor O’Donoghue, Mick Byrne, Noel Tuffy, Ian Duffy, Lester Burton, Joe Beale. Also in the picture 2 of the hot favourites, Bisto Gravy and Mint Sauce. Photo © Ken Wright Photography 2015.